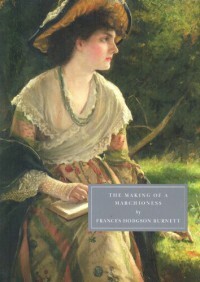 Before watching The Making of a Lady on PBS I had no idea that Frances Hodgson Burnett had written for adults and curiosity drove me to purchase and read The Making of a Marchioness. It bore little resemblance to the film, it lacked the romance and the action that a film requires to capture the attention of a broad audience. The book was much more sedate, in my opinion. There was still a threat to Emily's life and she was desperately in love with Lord Walderhurst, but all of the elements required to make a modern period film were gone and instead the book was "diluted with unromantic realism" (1). And that wasn't a bad thing. In The Making of a Marchioness Burnett develops a group of interesting and complex characters, and who can't appreciate that. While Lord Walderhurst is reserved and, dare I say, repressed the reader often catches glimpses of a softer side, unlike his heir Alec Osborn. Osborn is lazy, violent, and cruel. There is little doubt he is a true villain. His wife Hester definitely competed with Emily for my favorite character. She was pretty and clearly more intelligent, she at the very least had life intelligence. She struggled internally with her desire to have more in life with doing the right thing. She could be cruel and mean-spirited but at the same recognize what was being done for her and be thankful. I really admired Hester as a character, it was curious to watch her development throughout the book. But, ultimately, Emily was the heroine of this story. Emily Fox-Seton is an interesting character in that she is a very atypical heroine. She is neither very pretty nor very bright and typically a heroine will be one or the other or both. She doesn't even have youth. As of writing this review I'm finding it difficult to come up with another character that doesn't have either intelligence or looks. Emily is naïve, extremely suggestible, and as many characters point out, not very intelligent. But she is a sensitive creature, she lives for others, she's dedicated to seeing to the happiness of others before herself. Like Hester, Emily's development was also a very curious thing to watch. I feel that all too often we don't think people like Emily are worth writing about, they're not interesting enough for most writers or even for most readers. But characters like Emily are human too. They're humans who experience life just like those characters who are brilliant and/or beautiful and their stories can be just as touching to read. However, it wasn't Emily's story, or Hester's, or the plot that made this book very interesting, rather it was the frank assessment of late-Victorian/early-Edwardian courtship and marriage. The relationship dynamics between Lord and Lady Walderhurst and the Osborn's, according to Gretchen Gerzina who wrote the afterword for the Persephone edition, was a reflection of Burnett's own marriages and marriages similar to hers during the period. Additionally, the book also provided a fascinating look at class and race relations, that at times proved difficult to stomach, historically accurate or not. In the end I have to say that while I did enjoy the film a bit more, the book has definitely earned a place among my favorites as I appreciated viewing the world at the turn of the 20th century through Burnett's eyes and I look forward to reading more of her adult centered works. (1) Marghanita Laski, from the back cover of the Persephone edition.